I have previously written two lessons on the test at Rephidim so I will try not to duplicate the thoughts here. But, we learned more and more about this third test, so I wanted to write it down. The Israelites, led by the cloud and pillar, set out from the wilderness of Sin and traveled from place to place. They camped at Rephidim; means “place of rest,” where I’m sure they expected to find water, but there was none. So, they got mad and grumbled (Kaveched) against Moses and said “Give us water to drink”! They had some pretty strong words against Moses and God, here. They stepped over the line into a much more delicate situation because now they are testing God! Unless you give us water, we want out! We don’t believe you, anymore. 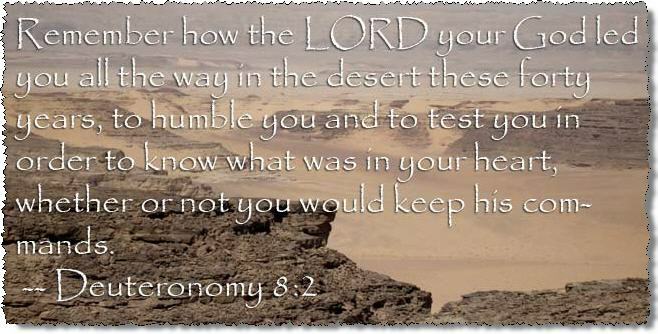 Vs. 7 says they said “Is the Lord among us or not?” We saw the cloud, we saw what you did in Egypt and the Red Sea and you said you’d go with us,” but now they are saying, we don’t believe you unless you show us! They are telling God, we won’t do our part unless you do yours and they raised their arm against God. This obviously doesn’t sit well with God, but surprisingly, He doesn’t hit them with a lightning bolt! He has surprising patience with them, and does an amazing thing for them. He sends Moses on ahead to Mt. Sinai, which was probably at least a day’s walk and tells him to hit the mountain of God with his stick. He did not hit just some ordinary rock, he hit the mountain of God, as if God was saying, I’ll take the blow, I’ll take the hit for this one.” I’ll go ahead and send them water. 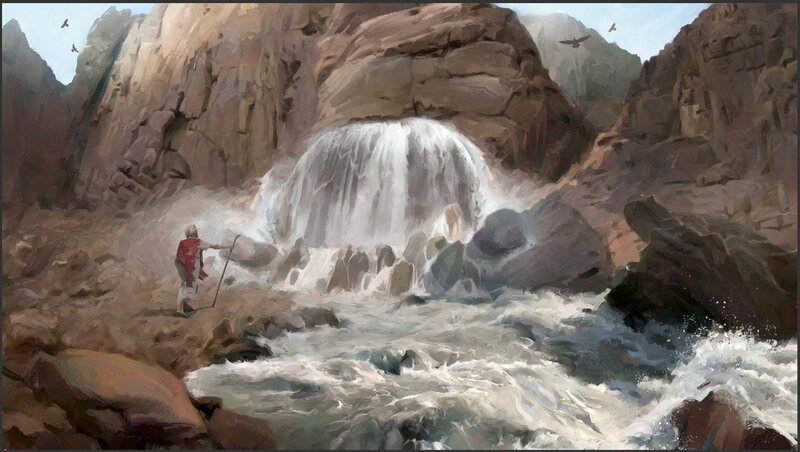 The water ran down the ravine, a day or day and 1/2; back to the Israelite camp. In ea. test, seize the opportunity to show God how committed you are to Him. How deep is your commitment? Will you only commit, if he does His part first? Three times, He put Israel to the Test. Each time, some didn’t match up but for the most part they learned and grew. Testing has a purpose – like the birth of a child , or like an athlete training for a race or match-no pain, no gain. God seemed to punish the Hebrews for saying is God among us or not? , because the next story he lets the Amalekites attack them at Rephidim. A lot of the Israelite’s Exodus experience was one of testing. God used trials and testing to get Egypt out of the children of Israel. 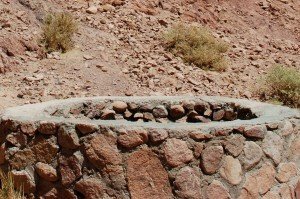 We talked a lot about testing during the time we spent in the Sinai wilderness on our trip. I learned several things from the trip that I thought might stimulate your thinking on testing. Should we pray to be tested or not? My first thought was always, No! I was always afraid if I got too serious about religion, God or the devil, one would start testing me. I didn’t want to willingly be asking to put myself in the wringer. I had a wrong concept of testing in the first place.The purpose of testing is to teach obedience. We should pray for obedience – “Lord help me to become more obedient,” and not worry about the rest. If we are serious about becoming a kingdom of priests, whatever God needs to do to accomplish our obedience to him, then let Him do it. Did the test he put me through show me where I need more work? Pain and suffering are not punishment; it is just part of the process of training. We have to change the concept in our mind to not think, “If I get serious, God is going to start testing me.”In conclusion, I am not saying we should pray to be tested, but pray that God would teach us to be obedient. God will do what He will as far as the testing is concerned. Are the tests we go through pass or fail tests? We may pass or fail, but that is not the important question. It is “How far along in the process are you”? How much progress have we made since we left the Red Sea? Testing is like training an athlete – “No pain, No gain.” When the Hebrew children came to Marah and they complained, did the pass or fail the test? They passed because they learned from the test. That’s testing, not pass or fail, but did you learn? We are to be like an athlete who has been in training in practice and wants to get on the field to see how far we has progressed. Why did Jesus have to be tested? Was his testing a pass or fail situation? Jesus was pushed to the limit to see if he was ready to go all the way with what God had for Him to accomplish. Heb 5:8 says that Jesus learned obedience from what He suffered. Just like Jesus, we are supposed to learn to be obedient through the tests he puts us through. To summarize, testing puts you in a position to see how far you will go! The situations we are put in are often illogical, irrational and even unnecessary from our perspective, just to see how far we will go; to see if our heart is in it 100%. God is asking,”Are you ready to go to the wall for me or not”? God walked the Israelites till they were ready to die of thirst and then gave them bitter water. He had them so hungry that they didn’t think they could go any farther, then gave them a subsistence diet of manna – just enough for ever day. He tests our commitment. Are we ready to follow him all the way, even if it’s on a subsistence basis? My question to myself and to you is,” How are you doing on the tests”?